Being busy achieving nothing is just as bad as idle-worshiping i.e. waiting around idly for something to happen that will never, ever, happen! Take for instance, a very hungry person sitting at the table with an empty plate praying and waiting for food (a well-prepared meal) to just miraculously appear on the plate to feed them. Do you know what the result will be? That's right, starvation! If you want something you have to get up and go and get it. Too often you meet people who are busy, busy, busy and have very little quality time to attend to important matters, loved ones, family and friends. They are so busy running around like headless-chickens doing absolutely nothing, no-thing at all for their business so much so, to the point that the business is running them instead of them - running "the business". There is nothing wrong with being busy but there must be a direct correlation with results and achievements. It's all about balance. Being able to effortlessly balance everything brings about harmony in your life. Avoid the extremes, rapid fluctuations between one extreme to the next brings about undesired turbulence and chaos which can have a devastating effect on your health and life. Instead, stay on the straight and narrow path (middle line) walked only by a few. With the right strategy it doesn't matter if the markets go up or down, if it's raining or sunny, good or bad, happy or sad, hot or cold etc. you can embrace both with the same open-arms and take advantage of any situation. After-all, they are opposites of the same thing. 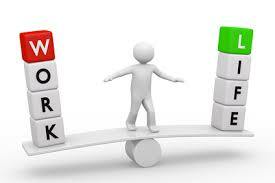 Work–life balance is key to success. This includes proper prioritising between "work" (career and ambition) and "lifestyle" (health, relaxation, pleasure, leisure, family and spiritual development/meditation). So, as a lifestyle choice do not become so busy with your business to the point that other equally important aspects of your life suffer as a consequence. Set realistic goals, action them, prioritise and be consistent.